I am very happy to report yesterday's visit. An eagle fed for sometime and was visited by a raven that crept right into the nest-bowl presumably scavenging for food morsels. Others have posted many photos on our online community site at: please visit us there for more details. We plan to post here once a week. Thanks Patrick, it was so cool to watch their interaction, the raven seemed respectful of the eagles position and in the end did get a mouthful of something. Watching the raven in the eagles nest moving a stick was pretty interesting too, just being so helpful. Do you remember a raven in the nest previously? Maybe in the winter or spring - they seemed to get along. Obviously these two do not fear each other, their prediators are maybe the same? Wish we had a RavenCam, they're so smart. Don't forget to vote Nov. 3rd! Thanks for the post Patrick. That was really something...couldn't believe the eagle let the raven get so close!! I'm still tuning in a few good seasons later here. I think I've been watching a good 5 years I wonder now? I wonder if the fall/winter coming up now we'll have more sightings again and perhaps a good successful nestling for fall/2009 and into 2010? Thank you for updating us with the awesome photo updates too..
BRI The 15 second update image is stuck. Thanks. 11/10/2009...Glad to see there is some interest in the nest, but I am concerned about the hammering and sawing that sounds like it is under the tree. It's just that close. Won't that drive any prospective nesters away? Lots of activity at the nest. BRI the instant image is stuck again. 11/14 8:33 am est I believe it has been stuck for at least two days. It has been so exciting to see lots of daily visits here this month. The eagles have brought in many sticks and have started to rebuild. Looks promising. Hope to see the weekly updates soon. I signed on in time to catch an eagle at the nest! It flew off about a minute later. 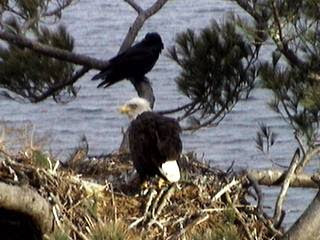 Adult eagle in the nest bowl feeding. Hi all, so is the camera down?? Or is the weather just brutal? 1/3 9:45am.m The storm has left & the nest is clear once again! Patrick, what do you know about birds sensing upcoming storms, maybe by sensing a drop in barometric pressue, and heading for shelter after a big meal to tide it over. I know there's alot of human thinking in that but even the feeder birds seem to disappear during the worst of the storms. Why are you not updating this blog? Wow, the adults have both been very busy all day today caring for their nest(I hope) bringing in sticks and providing entertainment as that big stick just got stuck and won't move! You can just see the thoughts going thru that little head as it tries to pull it every which way to no avail. Every few days the pair shows up and works like crazy on the nest..each bringing in sticks...trying out the nest bowl..then they seem to take a few days of rest. Coming in only to feed for a couple hours or making short little visits during the day to check things out. The prey that has been brought in appears to be mostly red meats...squirrels or other birds.. Surprising how bold the ravens are...particularly one .. There has also been a young eagle who has visited from time to time...I'm guessing it's looking for leftovers. Was wondering when the infra red vision will be started? Things are looking pretty promising right now..
Hope all the construction work has been finished and things stay calm there....giving this pair a chance to raise a family. Was also wondering if the microphone is working correctly...Sometimes the sound appears muffled. Still the best nest around...Thanks for everything. Jan 17th 0930 and I'm watching an eagle right now. So good to see things starting up again! Adult eagle on nest (1) could have been eating as I tuned in. Standing now, looking around skyward. Time 9:40a.m.